How do flowers know how big they have to grow? What controls the number, size and shape of floral organs? Tissue morphogenesis in plants depends on cell-cell communication as cells and groups of cells divide and expand in a coordinated fashion. 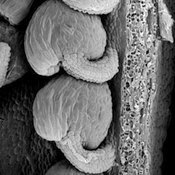 A plant-specific complication relates to the fact that plant cells are encased by a semi-rigid extra-cellular matrix, the cell wall. The cell wall constitutes a barrier to the communication between cells. 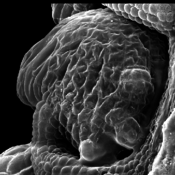 Moreover, it tightly connects plant cells to their neighbors. As a consequence plant cells do not migrate or intercalate and therefore tissue morphogenesis in plants depends on oriented cell division and unequal growth. It follows that plant cells have to constantly coordinate their behavior relative to their neighbors. The molecular mechanisms underlying these complex signaling processes are poorly understood. 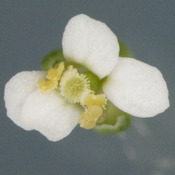 A mature wild-type Arabidopsis flower. SEM micrograph of mature sub-1 ovules. Model of SUB/QKY complex at PD. PD localization of EGFP:QKY (top row) and SUB:EGFP (bottom row) reporter proteins. Left three panels shows EGFP (green) and aniline blue (PD marker, blue) signals in root epidermal cells. Rightmost panels depict immunogold localization in root cortex cells. During evolution the obstacle of a cell wall has been overcome by at least two types of basic chemical signaling mechanisms. One involves trafficing of molecules through plasmodesmata (PD), membrane-lined channels interconnecting most plant cells. Another includes cell wall permeable ligands and their cellular receptors, for example cell-surface located receptor kinases. Our work on signal transduction mediated by the atypical receptor kinase STRUBBELIG (SUB) has revealed some of the first evidence for a functional connection between these two types of signaling processes. Previously we could establish that signaling mediated by the atypical receptor kinase STRUBBELIG (SUB) is required for tissue morphogenesis in Arabidopsis (Chevalier et.al. 2005; Yadav et.al. 2008, Vaddepalli et.al. 2011). With QUIRKY (QKY), ZERZAUST (ZET) and ANGUSTIFOLIA (AN) we genetically identified three additional components of the SUB mechanism (Fulton et.al. 2009, Bai et.al. 2013). Presently, we are involved in resolving how exactly these factors interact during SUB signaling. We could provide evidence that SUB and QKY function upstream of an unknown SUB-dependent mobile signal (SMS). 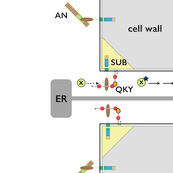 Moreover, our data revealed that SUB and QKY physically interact at plasmodesmata (PD) providing evidence for functional crosstalk between receptor kinase- and PD-mediated signal transduction (Vaddepalli et.al. 2014). Thus, we are exploring the exciting hypothesis that SUB signal transduction controls movement of the SMS factor through PD. Our work also revealed an exciting link between SUB signaling and the cell wall. ZET encodes an atypical β-1,3 glucanase (BG) that localizes to the cell wall (Vaddepalli et.al. 2017). Typically BGs degrade the cell wall polymer callose. Interestingly, however, ZET appears to be an atypical BG as our collective evidence indicated that its enzymatic activity is not required for function. Regardless, genetic evidence showed that ZET, SUB and QKY are all required for cell wall organization. It is now very interesting to investigate how SUB signaling controls tissue morphogenesis by connecting receptor-kinase-mediated signaling with cell wall and PD biology. SEM micrograph of a mature wild-type ovule. 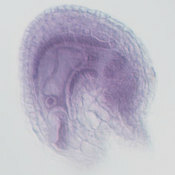 Optical section through a mature wild-type ovule. Cartoon of the integument organization. 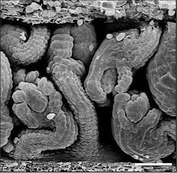 SEM micrograph of a ucn-1 ovule. 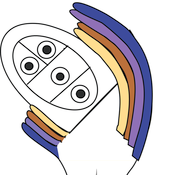 Once a cell layer, for example the outermost layer or epidermis, is formed stereotypic cell divisions are oriented along the plane of the epidermis. This two-dimensional or planar growth maintains the cell layer. How do cells of the cell layer coordinate their behavior correspondingly and what mechanisms suppress uncoordinated growth resulting in ectopic outgrowths? 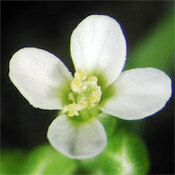 Arabidopsis integuments represent an attractive model to study the regulation of planar growth. They are lateral determinate tissues of the ovule and the progenitors of the seed coat. Each of the two integuments exhibits a stereotypic mode of development resulting in a simple two-layered laminar architecture. We could show that the AGC-type protein kinase UNICORN (UCN) suppresses ectopic growth and maintains planar growth in integuments of ovules and in the epidermis of other organs (Enugutti et.al., 2012, Enugutti and Schneitz, 2013). Our results indicate that proper control of adaxial-abaxial polarity is required for correct growth suppression during planar development. We are currently identifying novel components in UCN-signaling to elucidate further UCN-mediated planar growth control in plants.